The Grand Chancery Order of the Office of the President of Burkina Faso has recognized FIU as a Knight of the Rural Development Merit Order. The honor was recently presented to Lakhdar Boukerrou, a research associate professor in the Department of Earth and Environment who oversaw the USAID West Africa-Water, Sanitation and Hygiene (USAID WA-WASH) Program in Burkina Faso. For the past six years, he and his team worked to improve water and sanitation conditions in several rural communities throughout West Africa. The USAID WA-WASH program is part of a larger portfolio of international water programs in the FIU Institute of Water and Environment that seeks to improve water management services for vulnerable populations. 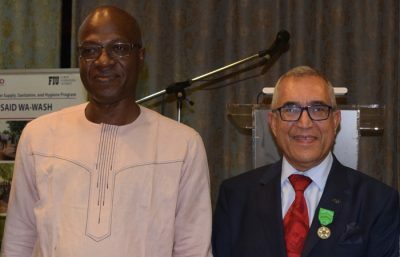 FIU professor Lakhdar Boukerrou, right, was recently presented with the Knight of the Rural Development Merit Order of the Grand Chancery of the Office of the President of Burkina Faso by the chief of staff of the Ministry of Water and Sanitation. In Burkina Faso, the FIU program constructed 4,922 household latrines for sanitation, installed 2,303 hand-washing stations for hygiene, helped 139 women gain access to plots for gardening, and trained more than 1,100 people on best agricultural practices for the promotion of food security. Hundreds of drinking water sources were improved in Burkina Faso, Niger and Ghana, impacting more than 65,000 people. According to the World Health Organization, more than 300 million people in sub-Saharan Africa live without access to clean drinking water. More than 4 billion people worldwide lack access to proper sanitation, according to data provided by USAID. “WA-WASH had an incredible impact on the communities where it intervened,” said Shawn Wozniak, agriculture officer and acting country representative for USAID/Burkina Faso. “Some communities went so far as to not only take on good WASH practices, but even became open defecation-free communities, a rare standing in Burkina Faso. Related to this, it was USAID WA-WASH’s sharing best practices that led USAID, UNICEF and others to push for non-subsidized community-led total sanitation, increasing the sustainability of WASH investments. Through USAID WA-WASH, FIU provided 72 scholarships to students in the region and developed a scholarship program that will continue, even though the WA-WASH officially concluded at the end of 2017. During its six years of operation, more than 250 students interned with the program and alumni of the program have gone on to create their own companies and work in established local, national and international organizations. Congratulations to FIU and especially to Dr Boukerrou for the good work in Burkina Faso!